The Real Deal At The Stand Juice Co.
Carissa and Mike Hvizdo didn't open The Stand Juice Company to cash in on a healthy living fad; they didn't do it as a gimmick. They did it because they literally stand 100% behind their mission "to provide good food and a better earth using the land to do so." We were invited to meet Carissa and sample what The Stand has to offer at a recent press event. It is the real deal and if you think vegan, healthy food can't be delicious, you better think again. Carissa and Mike met at a farmer's market. Raised on a farm, Carissa already had a passion for living off the land. Dealing with a rare blood disease, Mike has experienced firsthand the healing properties of real food. To keep his disease in check, he has no choice but to eat an all organic, plant-based diet. His personal experience led him to become a certified holistic educator and work with the Hippocrates Health Institute in West Palm Beach, FL. Upon returning to Connecticut from Florida, both Carissa and Mike had a renewed sense of purpose. With only their passion to guide them, they started their juicing business in 2005 out of their Norwalk rental cottage. From the beginning, their goal was to offer organic, GMO-free, sustainable, vegan based products to people who wanted a healthy food alternative. In fact, they offered the first juice cleanse in New England. "People kinda dug it," joked Carissa at a recent press gathering for the opening of the Westport location. Yeah, indeed they did. 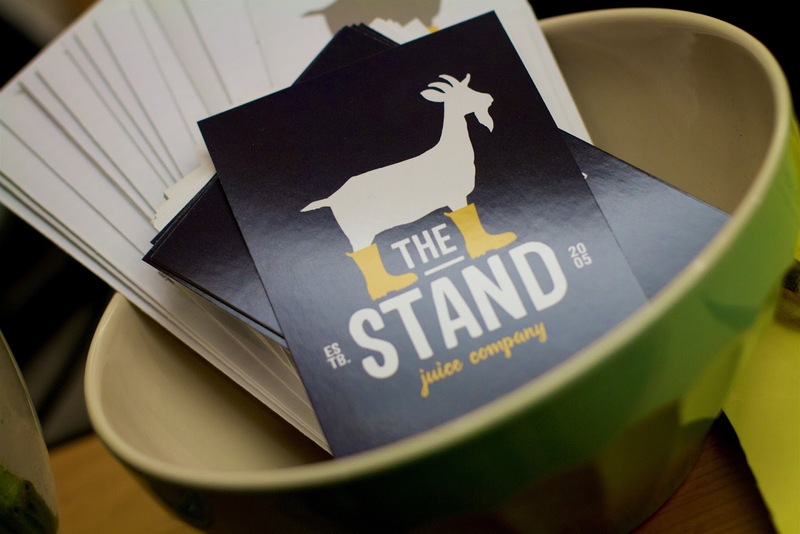 Demand has kept growing and The Stand Juice Company now has locations in Norwalk, South Norwalk, Fairfield, Westport, and soon in Greenwich. With the exception of bread and wraps, everything else is made from scratch by The Stand. Carissa and Mike can tell you where every ingredient comes from. They don't just know their farmers, they have a relationship with them getting to them and their families. The Stand is also zero waste. Everything is used or goes back to their farm. Oh, that's right, Carissa and Mike own, Hideaway Farm, 15-acres on the banks of the Connecticut River. Their farm is an organic, no-dig farm. The pulp and scrap produce from The Stand feed their growing menagerie of rescued farm animals. The manure in turn provides nutrients for the soil where they grow fruit and vegetables used for The Stand and other restaurants throughout Connecticut. The Stand has allergy protocols in place with equipment and kitchen areas that are dedicated nut-free and gluten-free. The Stand is also nearly soy-free. Carissa said she just didn't know where the soy was coming from anymore and didn't feel good about it. Other than their cookies, Carissa has developed ways to create without soy. While The Stand makes their almond milk every day, Carissa is experimenting with other types of milk. A water heavy crop, most almonds are grown in California so given the severe drought, Carissa is concerned about the environmental footprint of continuing to use almonds. She wants to find a more local, sustainable alternative. Sunflower seeds she said make a better milk, one that's more nutrient rich than almond milk. She's also been playing around with pumpkin seed milk. 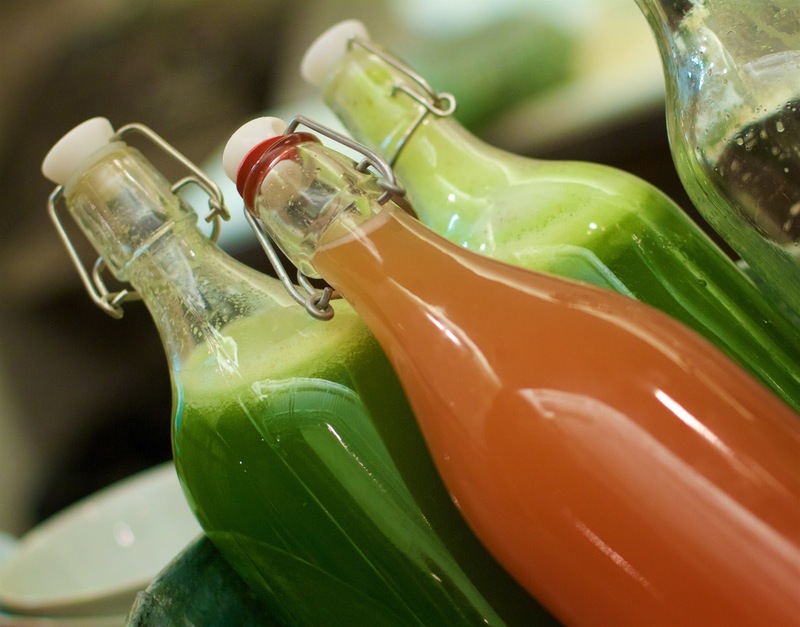 Their juice cleanse to this day isn't about weight-loss, it's about gaining health. She recommends starting with the 5-day cleanse. She said that the big health benefits don't really kick in if you do it for less time. It's not easy at first, but after the third day she said, "it kicks in" and it gets easier. When you sign up for a cleanse with The Stand, you come in each morning to pick up your 6-pack for the day. Just shake and drink. Of course, their menu is more than just juices. It includes smoothies, salads, sandwiches, soups and more. We tried a few items from each category. 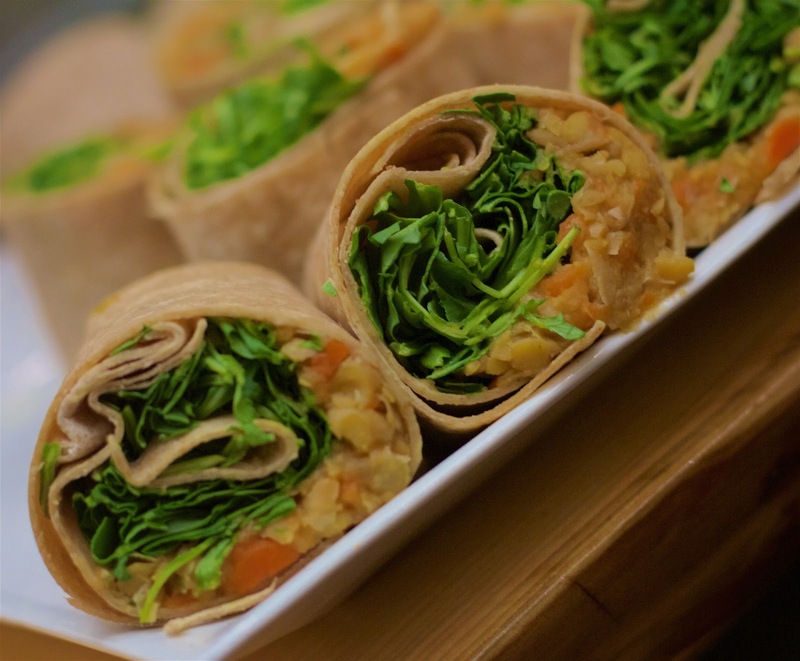 The Chickpea Roll-Up features chickpeas slow-roasted with fresh ginger, local maple syrup, and tamari, carrots, onion, and kale. Loved the flavoring of the chickpeas in this wrap. 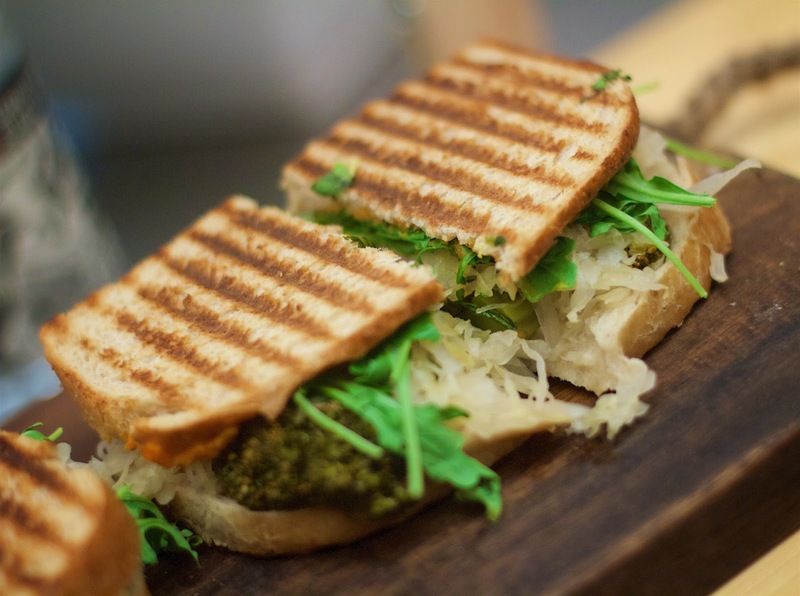 Their vegetarian take on a Reuben Sandwich features roasted broccoli stalks, local sauerkraut, arugula, with sweet + spicy carrot top sauce. Seriously, this really does taste like a Reuben from the regular deli. I was skeptical but glad to proven wrong. I really enjoyed this sandwich. The key to that Reuben flavor is all in the sauerkraut. The soups change daily. 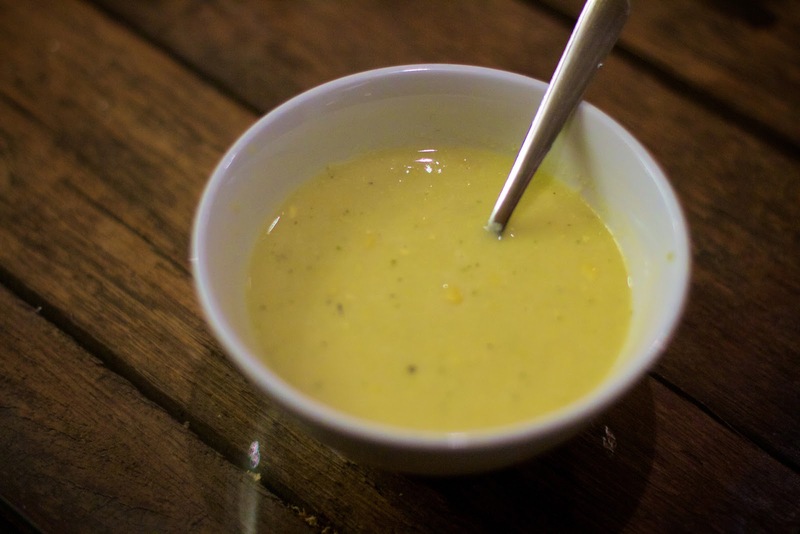 We sampled a bowl of vegan Corn Chowder. This was a very light and fresh take on corn chowder. We love a good avocado toast for breakfast or snack. The Stand makes theirs with sea salt and cayenne pepper, loaded with tomato, basil, and olive oil. 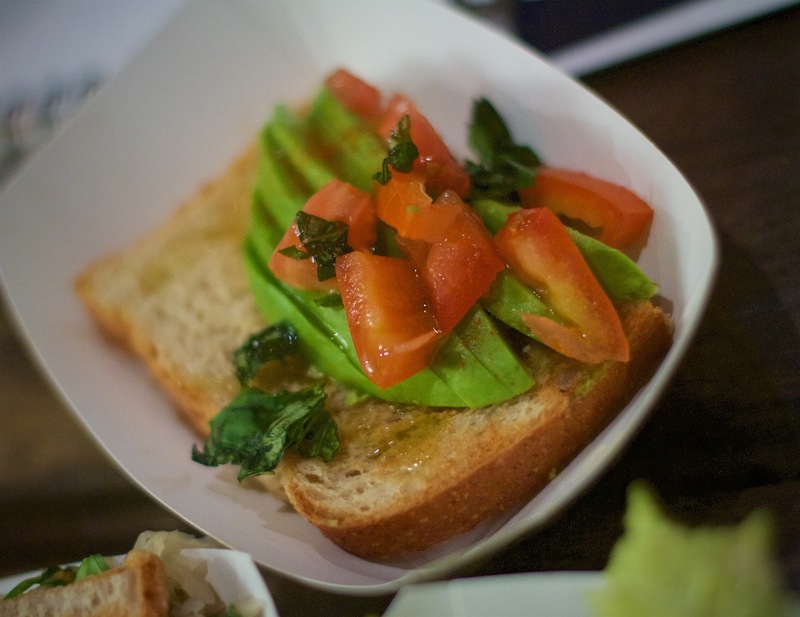 It's like bruschetta with some avocado. It's so simple but so darn good. 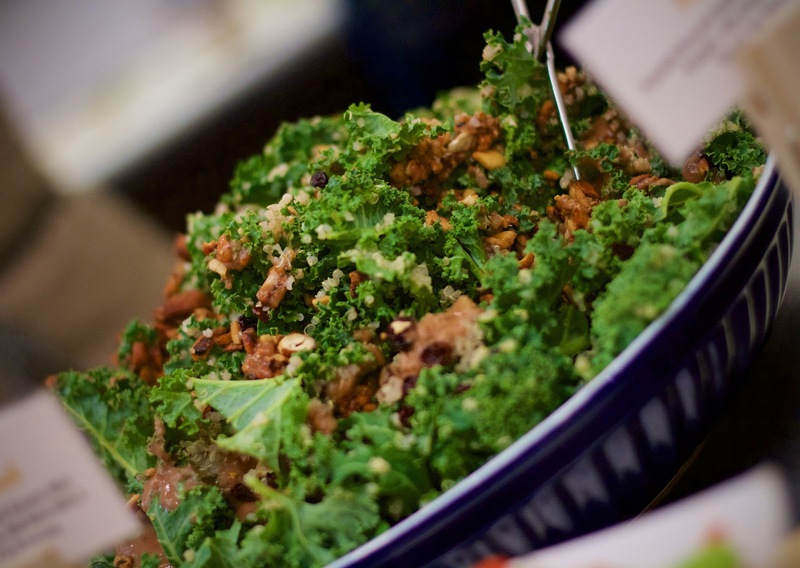 Of the salads we tried, of course, we loved the Green salad featuring marinated kale and collard greens with currants, ancient grains, and nuts with a slightly sweet fig dressing. Super hearty and the fig dressing tied it all together. We tried a few items from the "Something Blended" menu category. 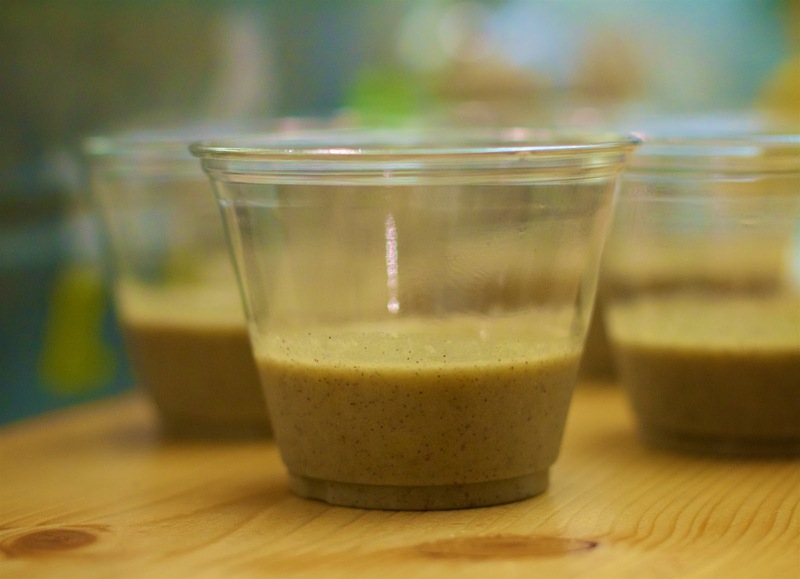 My favorite was the Hempster Shake featuring apple, banana, cinnamon, and hemp protein. I definitely recommend giving it a try. Carissa and her team make a daily selection of treats using seasonal ingredients. 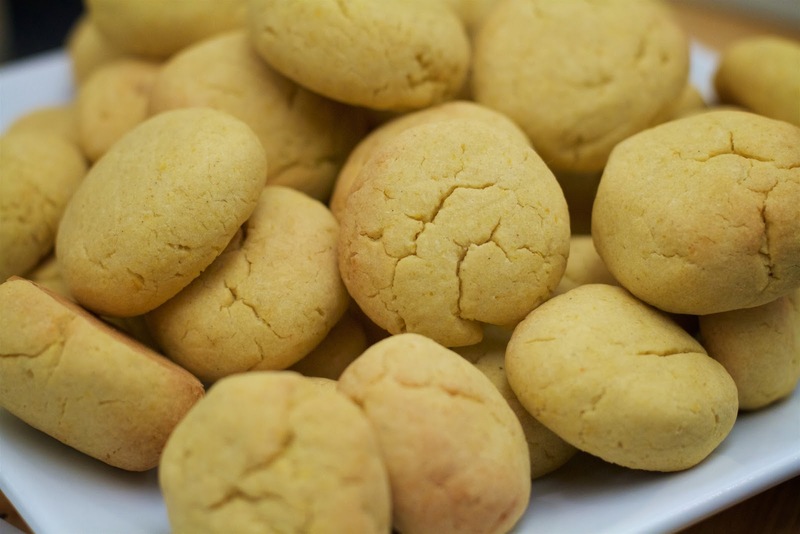 We sampled Butternut Squash Cookies made with rice flour. I loved them because they were not too sweet and had a dense, crumbly texture. Renato agreed that they would be perfect for dunking. 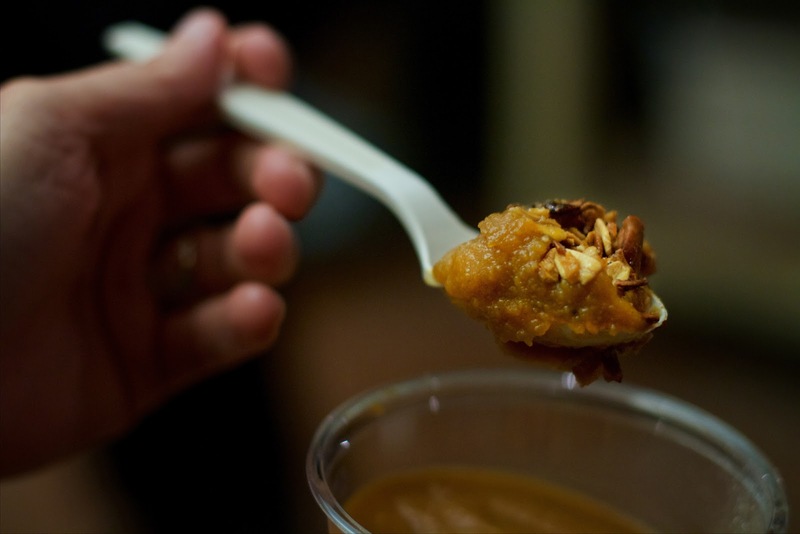 We finished off our tasting with a Parfait of super thick pumpkin puree and homemade nut-o-la. I could have talked with Carissa for hours. Her passion and commitment to this healthy lifestyle are contagious. She is incredibly knowledgeable and cares so deeply about what she does. The dishes prove that healthy can be delicious. And knowing the quality level of the ingredients, I'd say the menu is reasonably priced. All I can say is that I wished I lived closer to one of their locations. Maybe they'll open another location in northern Fairfield County some day. I know I'd be a regular customer if they did. Have to head down there! Looks really good! I'm not too far from their Norwalk location. And I'm gonna have to Google what a "no-dig" farm is!